Breakfast in Virginia is a sacred meal. It’s hearty, meant to keep you full for the rest of the day. That’s why our pancakes are huge and filled with stuffing as varied as fruit or sausage. Start your day the Virginian way, with a huge stack of pancakes from one of the following best pancake places in the Old Dominion. Pocahontas Pancakes in Virginia Beach was voted “Best Pancake House” by “The Food Network.” Originally opened in 1974, the pancake house continues to deliver award-winning quality at great prices. L’Dees Pancake House is another award winner, having been voted “best breakfast” by Virginia Living readers. Breakfast is served anytime and has the regular variety of French toast and omelets, along with fourteen different kinds of pancakes. The Colonial Pancake House in Williamsburg, Virginia boasts 11 different kinds of pancakes, including pigs in a blanket (sausage links wrapped in pancakes), chocolate chip, and apple pie. Add meat to your order or, if you’re feeling up to it, another stack. The Pancake House and Grill in Norfolk, Virginia is open from 7 a.m. until a quarter to 3 p.m. every day. They’re known for their original pancakes, made with “only the finest ingredients cooked in our own unique recipes.” Of their thirteen options, we recommend trying the sweet potato pancakes first. Mabry Mill Restaurant and gift shop offers a “country-style menu, featuring our famous sweet potato, cornmeal, buckwheat, blueberry and apple pancakes,” served all day. They have other food options, but you won’t need them. The New York Times described Blue Grass’s food as “hearty southern comfort fare,” and we agree. The portions are large and the flavors new and exciting. 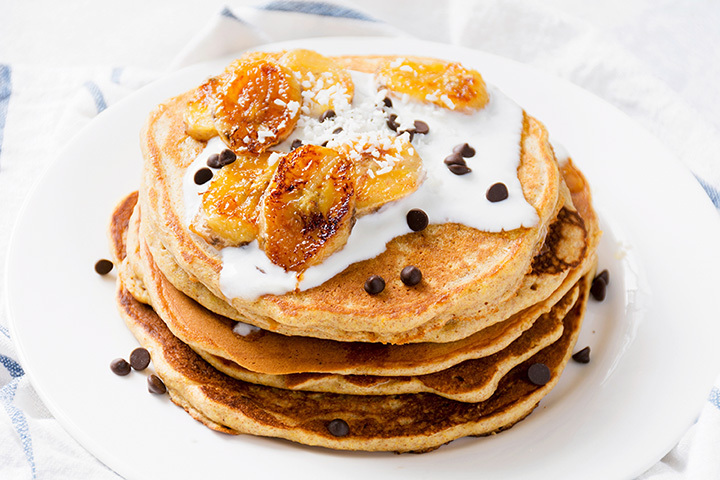 If you can only choose one, we’d say go for the banana foster pancakes. The Little Grill Collective is one of Virginia’s most well-known restaurants. Known for its eclectic style and delicious food, their pancakes will keep you talking about them long after the plate leaves the table. Try their fruit-topped cornmeal cakes. We know what you’re thinking—what’s a pizza place doing on a pancake list? Del Ray Pizza isn’t just any old pizza place. They do brunch, too. Their brunch menu includes lain, chocolate chip, blueberry, and strawberry pancakes. Pancakes N Things in Chesapeake, Virginia is a cash-only breakfast spot serving delicious, homecooked and hearty food. Choose from chocolate chip, buttermilk, silver dollar, and pigs in a blanket, all of which are fantastic. D’Egg has two locations in Norfolk, Virginia. They offer seven buttermilk pancake options, including strawberries, fruity pebble, cinnamon roll, and more. For those that prefer the traditional take on pancakes, go for their buttermilk only option.